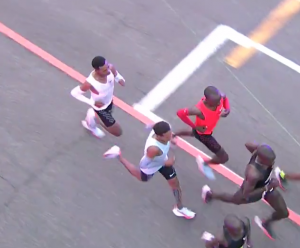 For me, watching these runners tackle this huge goal and understanding the work of the team behind them was a powerful reminder of how inspiring sport can be. 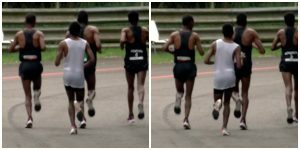 The three runners Nike selected for this project are Lelisa Desisa (last, in white), Eliud Kipchoge (middle, in red), and Zersenay Tadese (first, in grey). They also had a fleet of amazing pacers. As you can see right away, Desisa is having a tough time with his hip flexors. As he passes his stance foot and his hip flexor runs out of play, it pulls his pelvis into a deeper anterior tilt and he arches his back to keep from face planting. Hence the deep lumbar curve, expanded chest, and retracted head. Let me emphasize that anterior pelvic tilt is necessary for running, particularly at high speeds. But hip flexors that won’t lengthen enough for adequate stride length increase that with a strong pull and the nervous system reacts to protect the runner. Trying to run fast while this is going on is a terrible feeling. I didn’t recall seeing this to such a degree previously in Desisa’s running. A quick scan of Google images shows he has a modest habit of running like this, but nowhere near the severity of today. Perhaps travel tightened up his hips (airplane seats are a major culprit for doing this) perhaps stress and anxiety tightened his posas (which it can definitely do), or perhaps his nervous system was reacting to something about the special shoes, which I was concerned about when I learned about the graphite plate. I’m sure I understand imperfectly how those shoes work, but I do know there’s no such thing as free energy, so an extra spring in the shoes to propel a runner forward will also have to be loaded with each step–a kind of effort different from simply running. It seems likely to me that the work of loading the spring will happen in the opposite direction that the spring creates propulsion–namely pushing the runner backwards a little with each step. Skipping forward to Tadese, I’ve watched his technique with interest for years. His head is quite distinctly forward, with a relaxed and wide upper back. Most of the time when runners move their heads forward like this, they counterbalance it by moving their backs upright, destroying their forward lean. 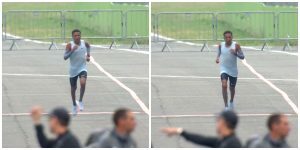 However somehow Tadese also maintains a significant forward lean–you can see it’s slightly more than Kipchoge’s. Runners tend to be so concerned about not slouching, hunching, or rounding any part of themselves that they end up harming themselves with the excess tension they use to straighten up. I’ve always felt that Tadese’s big lean and large head movement, though it may look sloppy, is a huge asset for his running. I’ve written about Kipchoge’s form before with great admiration. Today he was a marvel of economical movement and internal focus. Particularly clear from the side view is his head placement exactly in line with his torso (on a forward angle)–something I teach via this lesson. 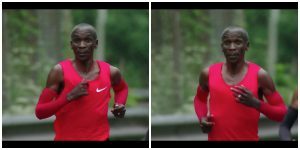 Kipchoge is more of a frontal plane runner than a transverse plane one, meaning he uses less rotation of his upper body and pelvis, and more lateral action. I must say, it was with great pleasure I watched that little gizmo attached to the center back of his waistband move side to side, showing his pelvic rotation (movement in the transverse plane). That’s often hard to see in runners but here, thanks to that reference point, it was crystal clear. Kipchoge’s perfect form remained intact to the very end, though small “tells” of his fatigue appeared in the last few kms. First, his lean reduced slightly, his head moving back a small but significant amount. Second, and most interestingly, asymmetry suddenly appeared in his running. His head shifted rightwards, oscillating from his right foot to between his two feet rather than from right to left. Though I didn’t get good screenshots showing that, I did capture these just before the end. Note his right hand is closed and his left hand is open. The muscular tonus of the hands is connected to the tonus of the entire body and shows us the same thing his head movement does: the right side is shortening and contracting. It was, in fact Kipchoge’s shoe insole mishap in the Berlin Marathon 2015 that first alerted me to the prevalence of this kind of asymmetry, and in this event it was interesting to note that not only Kipchoge, but in fact all three runners shortened on the right side as they fatigued. Here you can just make out Tadese’s head oscillating over the right leg as he approaches the finish line, just like Kipchoge’s did. And here you can see from behind that Desisa bends right, shortening from shoulder to hip, regardless of which foot he’s on. And when he’s on his right foot the bend is extreme. So here’s my question to the scientists involved in this project: next time, would this phenomenon be a factor to consider in improving performance when fatigue sets in? And then, say, add a little weight at the base of the neck on the left side to exert pressure in the other direction to relieve runners of the effort they make to correct for this when they’re fresh and struggle with it when they’re tired? Nah, scratch that about the weight, as there will be unintended consequences. But at least figure out the reason so we know what we’re dealing with. A lot of runners with runner’s knee on the right side, achilles tendonitis on the right side, piriformis syndrome on the right side, plantar fasciitis on the left, and IT band syndrome on the left will thank you. In fact, it will move the whole sport forward. Registration for The Balanced Runner Online Camp opens Sunday, May 7, 2017. Eliminate excessive overstriding, balance your asymmetries, and learn to run with a good core action, a strong and effective armswing, and a great lean. Learn more here. Fascinating read Jae. Thank you for posting it so soon! Could the asymmetric fatigue be simply due to the direction they were turning on their loop? It is a natural conclusion, Travis…see the other comments here and my responses. As a non-runner I found this fascinating and informative. Thank you. Hello, Jae, love your website, and great analysis of these runners. Joe, so great to hear from someone else who has seen what I’m talking about. I originally thought it might have something to do with the track as well but then I started asking my clients and many of them have never run on a track. The chicken and the egg may be in the other order–I don’t know where the custom to run counterclockwise on the track came from (surely someone reading this does and will clue me in), but perhaps people gravitated towards it because it matched an existing pattern in our movement. Do you notice a correlation between people being left footed or right footed or with their hands? Well that’s the thing, Roger. Definitely no correlation with handedness, and we don’t have ‘footedness’ the same way we have handedness. We have a preferred standing leg and a preferred gesture leg. And the preferred standing leg is nearly always the left, unless some history of injury complicates matters. The preferred gesture leg is the right. And that is exactly the asymmetry I’m talking about here. Tyler, I agree with you that 18 laps in the same direction doesn’t seem too great for the runners, and I would be inclined to agree that there’s a connection except that I saw this pattern in Kipchoge first in the Berlin marathon, and I see it all the time, in all kinds of runners, including ones who’ve never set foot on any track. Wow, I loved reading this. I for sure shorten right with my running. After reading this I initially thought “oh that darn liver.” Yet, the heart is orientated on the left side of the body, and if I’m not mistaken, the heart weighs more than the liver. Factoring in just those two organs, the pull should be to the left. But again, that’s only factoring in two organs. I always thought the liver was the heaviest, but your comment made me go google it, and sure enough the average adult liver weighs 1.6 kg (3.5 lbs) and the average adult human heart weighs 250-350 g, or about 1/6 as much. So the heart is nowhere near enough of a counterbalance. I’m tempted to wax poetic about this and/or to make wisecracks about weighing down the hearts of the next set of runners to undertake this challenge, but maybe I’ll just leave well enough alone. Your theory that this would be a manifestation of wearing a spring loaded shoe is interesting. But what has that to do with the hyperextension? Would have been great to zoom into this pics, but can’t do it through a PC. Thanks, Ron, for the confirmation of how unusual this was for Desisa. The process whereby I could imagine the shoes as a potential cause is that if the spring in the shoes is loaded as weight comes onto the forefoot, that means there’s a little resistance to weight coming onto the forefoot that isn’t usually there. People respond differently to sensations like this, but one way would be to contract the hip flexors to avoid putting weight on the forefoot as much as usual to avoid that feeling of resistance. I have no idea if this was actually happening for Desisa, it’s just one possibility. what kind of specific workouts would these be to improve/strengthen the flexor and extensor muscles? maybe i am also not stretching these muscles enough post workout. It’s not about stretching or strengthing, but about learning the coordination. Try the free lesson you can get on that page and you’ll see what I mean. The person I always love watching is Lagat, particularly in this race while he was pacing. How well do you think his form would work for an entire marathon? I enjoy watching Lagat, but I think he lacks the lean and the freedom in his head that he would need to do his best in the marathon. He’d have to learn those. Love the analysis and comments. Yes the liver is much heavier than the heart and the thickest widest heaviest part of it is lateral and the spleen on the left side doesn’t match it for weight and size. We say the heart is left but about 3/4 of it is on the left and 1/4 on the right of midline. I hadn’t heard the expression gesture leg before? I am intrigued by he stat that 90% of people have the Left standing leg and the bias to be shorter on the Right. I guess the personal project is to find how to function well with asymmetry and reduce the differences when they impact with injuries, pain and loss of function. Having done the Running camp before it goes a long way to balancing out the extremes. Kipchoge asymmetry in the hands is not due to fatigue. Most of the time he runs like this, even in the beginning of races. Left hand with the ring is open, and the right is slightly more fisted. About the head bends to the right- I think it is due to the breathing pattern which always creates asymmetry. When they take the deep breath, they probably do it on the right foot and to get maximum air into the lungs they stretch the trapezius muscle by lowering the shoulder- that’s why it looks like this. Maybe it’s more prominent when they are tired. 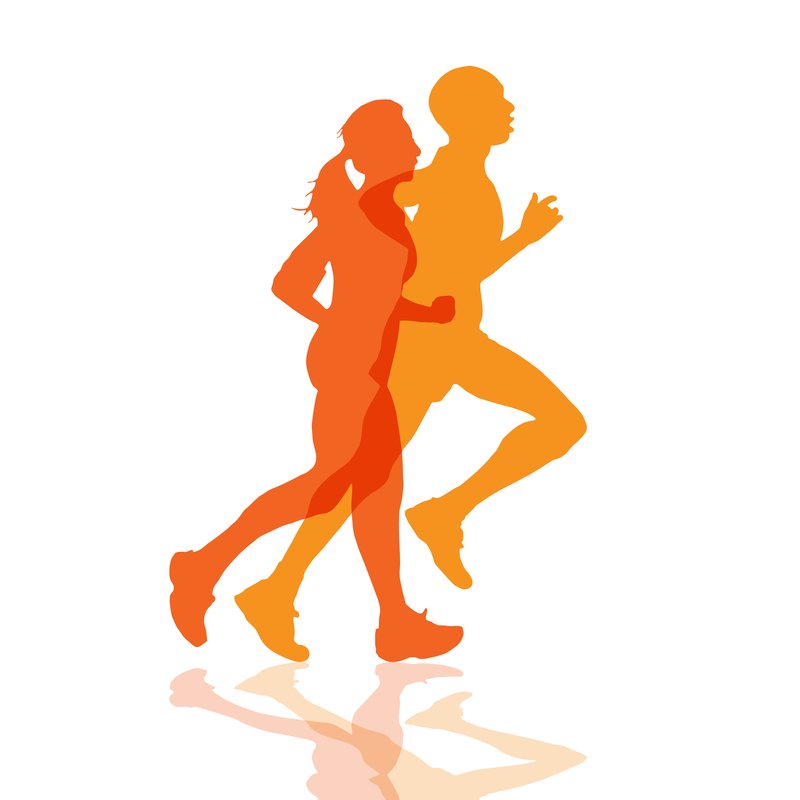 Most runners breath 2-2, which means exhaling on the same foot creating asymmetry.